Anti-Aging Eye Serum 15 ml / .50 fl. oz. The eye area looks younger; the eye seems larger and more brilliant. The aging of the eye contour area is not limited to under-eye bags and dark circles. Combined with drooping upper and lower lids, these problem areas are often the leading cause for aesthetic interventions such as surgery. 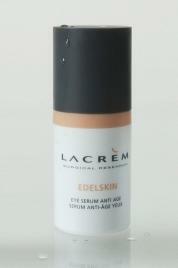 With Dr. Emeri’s experience, Lacrèm has developed this innovative product that treats the specific problems of the eye contour area. Innovating polymer: forms a toning film that lifts the eyelids, creating wider, more open-looking eyes that appear less fatigued. Association of a peptide and a vegetable protein: fights against dark circles by activating the micro circulation. A Soft focus effect with micro particles: reflects the light to diminish the visibility of the wrinkle and crows feet. Its non-greasy, unscented formulation was specially developed to respect sensitive eyes and those who wear contact lenses. Apply daily, morning and evening before any other skin care. 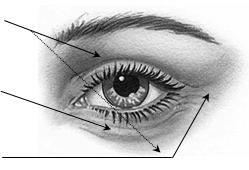 To aid the serum’s absorption, massage the product into the eye area by applying in a circular motion. Apply from the inner corner of the upper lid towards the crow’s feet and then, from there, towards the inner bottom corner of the eye.